What is the ultra-ultra-large scale structure of the universe? 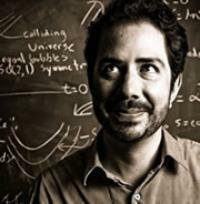 Physicist Anthony Aguirre studies the formation, nature, and evolution of the universe, focusing primarily on the model of eternal inflation—the idea that inflation goes on forever in some regions of universe—and what it may mean for the ultimate beginning of the universe and time. He is the co-founder and associate scientific director of the Foundational Questions Institute, which supports research on questions at the foundations and new frontiers of physics and cosmology. Anthony is also a co-founder of the Future of Life Institute, an organization aiming to increase the probability that life has a future, and of Metaculus, an effort to optimally aggregate predictions about scientific discoveries, technological breakthroughs, and other interesting issue.